Welcome to the second in the series of our occasional blogs about the wonderful sponsors of the 9th Elysian Winter Beer Festival. Not all of the blogs will have 3 in the title – so far we have had Three Blind Mice and now 3at3! 3at 3 are very kindly sponsoring the beer mats which you should see appearing very soon. 3at3 are situated at Three Cups Walk, Ely, CB7 4AN. If you park in the car park at Fore Hill, you have probably walked past the premises a number of times. However, it is set back slightly from the main road down Three Cups Walk and is easy to miss, but to miss it would indeed be a travesty, so watch out for the blackboard enticing you in. It is now approaching 7 years since 3at3 opened and started to build the 3At3 Bottle Conditioned Real Ale ‘Beer Library’, the only Real Ale Bottle Shop in Ely. Since those early beginnings 3at3 have grown to become a superb Real Ale and Craft Beer Café. It is a great place to pop in to browse the beers on display and to decide what you are going to take home and try or even better to stay and have a drink and sample the wonderful food on offer, as I regularly do. 3at3 is a very friendly place with great staff and they are very welcoming. 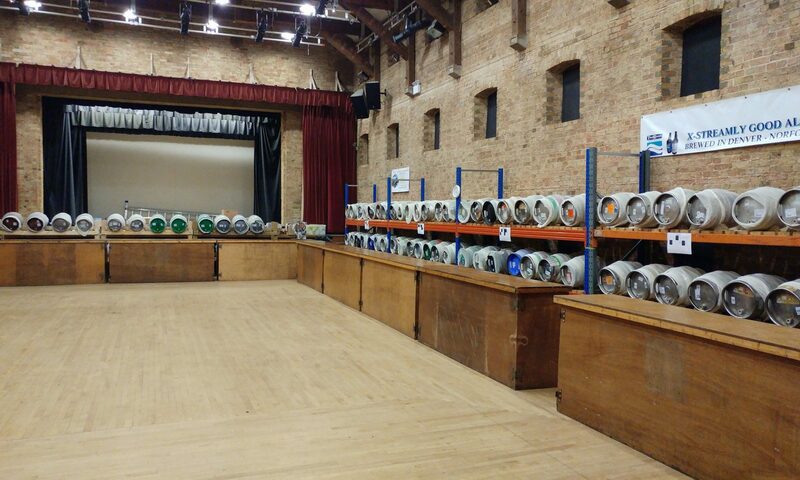 Gradually, over time, the Beer Library grew year on year to over 150+ different beers from 25+ microbreweries, concentrating initially on a growing number of superb small micro-breweries in Cambridgeshire, Norfolk and Suffolk. Over the last two years 3at3 have continually reviewed the library and made a conscious decision to reduce the number of session beers and grow the library with the increasing number of craft beers being produced, bringing in different beers with so many levels of flavours from multiple malt brews and hops as well as weird and wonderful added flavours, squid ink being a particular favourite. Since April 1st 2017, 3at3 have been serving draft craft beer from KeyKeg, not only from local breweries, including one of our other sponsors, Three Blind Mice (and 3at3 have a different one of their beers on continually), but also beers from further afield from all over the UK. 3at3 also stock a growing range of craft beer cans and had recently to install another refrigerator specifically for this purpose. 3At3 is not a traditional pub or a micro-pub but a European style Real Ale & Craft Beer café. Penny and Graeme, having lived and worked in The Netherlands for 12 years or so, had experienced the European Café culture at first hand and wanted to bring that experience to Ely. The secluded sunny terrace with a large parasol to provide shade in summer and heat from the heaters during colder spells, is an ideal place to relax with a great beer from the library or from the continually changing draft craft beer selection. Future plans include looking to increase the size of the cold store and the number of craft beers on tap next year as well as continuing to build the craft can selection and bottle conditioned real ales. 3at 3 will also provide great craft beers as a beer festival fringe location, so be sure to visit them over the weekend of 26th and 27th January to try some more different beers.